To investigate the frequency of latent prostatic carcinoma (PCa) and prostatic intraepithelial neoplasia (PIN) in the Turkish population. Materials and methods: PCa and PIN were evaluated in 116 male autopsy cases in which the cause of death was nontumoral. All patients were Turkish, living in İstanbul, and aged 40-79 years. Results: The prevalence of PCa was 19.8% and the decade rates (decades 5-8) were 9.5%, 12.5%, 18.8%, and 37%, respectively (P < 0.011). The rates of high-grade prostatic intraepithelial neoplasia (HGPIN) were 33.3%, 31.3%, 56.3%, and 25.9% for decades 5-8, respectively (P > 0.05). A total of 68.4% of PCa cases were HGPIN. There was a statistically significant correlation among HGPIN, PCa, and Gleason scores (P < 0.002). Conclusion: The prevalence of latent PCa in the Turkish population is very high (19.7%). In order to determine latent PCa cases, males over 40 years of age must be screened more strictly. Grönberg H. Prostate cancer epidemiology. Lancet 2003; 361: 859-64. 2. La Rosa F, Stracci F, Minelli L, Mastrandrea V. Epidemiology of prostate cancer in the Umbria region of Italy: evidence of opportunistic screening eff ects. Urol 2003; 62: 1040-4. 3. Farkas A, Schneider D, Perrotti M, Cummings KB, Ward WS. National trends in the epidemiology of prostate cancer, 1973 to 1994: evidence for the eff ectiveness of prostate-specifi c antigen screening. Urol 1998; 52: 444-9. 4. Crawford ED. Epidemiology of prostate cancer. Urol 2003; 62: 3-12. Sakr WA, Grignon DJ, Haas GP, Schomer KL, Heilbrun LK, Cassin BJ et al. Epidemiology of high-grade prostatic intraepithelial neoplasia. Pathol Res Pract 1995; 191: 838-41. Sakr WA, Grignon DJ, Crissman JD, Heilbrun LK, Cassin BJ, Pontes JJ et al. High grade prostatic intraepithelial neoplasia (HGPIN) and prostatic adenocarcinoma between the ages of 20-69: an autopsy study of 249 cases. In Vivo 1994; 8: 439-43. Sakr WA, Grignon DJ, Haas GP, Heilbrun LK, Pontes JE, Crissman JD. Age and racial distribution of prostatic intraepithelial neoplasia. Eur Urol 1996; 30: 138-44. Bostwick DG. Prostatic intraepithelial neoplasia. Curr Urol Rep 2000; 1: 65-70. Sanchez-Chapado M, Olmedilla G, Cabeza M, Donat E, Ruiz A. Prevalence of prostate cancer and prostatic intraepithelial neoplasia in Caucasian Mediterranean males: an autopsy study. Th e Prostate 2003; 54: 238-47. Stemmermann GN, Nomura AM, Chyou PH, Yatani R. A prospective comparison of prostate cancer at autopsy and as a clinical event: the Hawaii Japanese experience. Cancer Epidemiol Biomarkers Prev 1992; 1: 189-93. Gatling RR. Prostate carcinoma: an autopsy evaluation of the infl uence of age, tumor grade, and therapy on tumor biology. South Med J 1990; 83: 782-4. Billis A. Latent carcinoma and atypical lesions of prostate. An autopsy study. Urol 1986; 28: 324-9. Breslow N, Chan CW, Dhom G, Drury RA, Franks LM, Gellei B et al. Latent carcinoma of prostate at autopsy in seven areas. Collaborative study organized by the International Agency for Research on Cancer, Lyons, France. Int J Cancer 1977; 20: 680- 8. Montie JE, Wood DP Jr, Pontes JE, Boyett JM, Levin HS. Adenocarcinoma of the prostate in cystoprostatectomy specimens removed for bladder cancer. Cancer 1989; 63: 381-5. Moutzouris G, Barbatis C, Plastiras D, Mertziotis N, Katsifotis C, Presvelos V et al. Incidence and histological fi ndings of unsuspected prostatic adenocarcinoma in radical cystoprostatectomy for transitional cell carcinoma of the bladder. Scand J Urol Nephrol 1999; 33: 27-30. Abbas F, Hochberg D, Civantos F, Soloway M. Incidental prostatic adenocarcinoma in patients undergoing radical cystoprostatectomy for bladder cancer. Eur Urol 1996; 30: 322- 6. Kabalin JN, McNeal JE, Price HM, Freiha FS, Stamey TA. Unsuspected adenocarcinoma of the prostate in patients undergoing cystoprostatectomy for other causes: incidence, histology and morphometric observations. J Urol 1989; 141: 1091-4. Revelo MP, Cookson MS, Chang SS, Shook MF, Smith JA Jr, Shappell SB. Incidence and location of prostate and urothelial carcinoma in prostates from cystoprostatectomies: implications for possible apical sparing surgery. J Urol 2004; 171: 646-51. Pritchett TR, Moreno J, Warner NE, Lieskovsky G, Nichols PW, Cook BA et al. Unsuspected prostatic adenocarcinoma in patients who have undergone radical cystoprostatectomy for transitional cell carcinoma of the bladder. J Urol 1988; 139: 1214-6. Ward JF, Bartsch G, Sebo TJ, Pinggera GM, Blute ML, Zincke H. Pathologic characterization of prostate cancers with a very low serum prostate specifi c antigen (0-2 ng/mL) incidental to cystoprostatectomy: is PSA a useful indicator of clinical signifi cance? Urol Oncol 2004; 22: 40-7. Fowler JE, Bigler SA, Lynch C, Wilson SS, Farabaugh PB. Prospective study of correlations between biopsy-detected high grade prostatic intraepithelial neoplasia, serum prostate specifi c antigen concentration, and race. Cancer 2001; 91: 1291-6. Villeneuve PJ, Johnson KC, Kreiger N, Mao Y. Risk factors for prostate cancer: results from the Canadian National Enhanced Cancer Surveillance System. Cancer Causes Control 1999; 10: 355-67. Akduman B, Alkibay T, Tuncel A, Bozkirli I. Th e value of percent free prostate specifi c antigen, prostate specifi c antigen density of the whole prostate and of the transition zone in Turkish men. Can J Urol 2000; 7: 1104-9. Moul JW, Wu H, Sun L, McLeod DG, Amling C, Lance R et al. Epidemiology of radical prostatectomy for localized prostate cancer in the era of prostate-specifi c antigen: an overview of the Department of Defense Center for Prostate Disease Research national database. Surgery 2002; 132: 213-9. Silvestri F, Bussani R, Pavletic N, Bassan F. Neoplastic and borderline lesions of the prostate: autopsy study and epidemiological data. Pathol Res Pract 1995; 191: 908-16.
International Agency for Research on Cancer. Prostate cancer incidence and mortality worldwide in 2008. Available from: URL: http://globocan.iarc.fr/factsheets/cancers/prostate.asp. Brawley OW, Knopf K, Th ompson I. Th e epidemiology of prostate cancer part II: the risk factors. Semin Urol Oncol 1998; 16: 193-201. Taylor JD, Holmes TM, Swanson GM. Descriptive epidemiology of prostate cancer in metropolitan Detroit. Cancer 1994; 73: 1704-7. Pu YS. Prostate cancer in Taiwan: epidemiology and risk factors. Int J Androl 2000; 2: 34-6. Brawley OW, Knopf K, Merrill R. Th e epidemiology of prostate cancer part I: descriptive epidemiology. Semin Urol Oncol 1998; 16: 187-92. Perrotti M, Rabbani F, Farkas A, Ward WS, Cummings KB. Trends in poorly diff erentiated prostate cancer 1973 to 1994: observations from the Surveillance, Epidemiology and End Results database. J Urol 1998; 160: 811-5. Kurokawa K, Ito K, Yamamoto T, Takechi H, Miyamoto S, Suzuki K et al. Comparative study on the prevalence of clinically detectable prostate cancer in patients with and without bladder cancer. Urol 2004; 63: 268-72. Yang CR, Ou YC, Ho HC, Kao YL, Cheng CL, Chen JT et al. Unsuspected prostate carcinoma and prostatic intraepithelial neoplasm in Taiwanese patients undergoing cystoprostatectomy. Mol Urol 1999; 3: 33-9. Fujita MQ, Shin M, Yasunaga Y, Sekii K, Itatani H, Tsujimura T et al. Incidence of prostatic intra-epithelial neoplasia in Osaka, Japan. Int J Cancer 1997; 73: 808-11. ISNAD AKPOLAT, Nusret , BÜYÜK, Yalçın , UZUN, İbrahim , GEÇİT, İlhan , KURNAZ, Gülay . "Prevalence of latent prostate cancer and prostatic intraepithelial neoplasia in İstanbul, Turkey: an autopsy study". 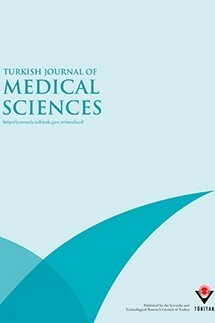 Turkish Journal of Medical Sciences 42 / 3 (March 2012): 449-456.